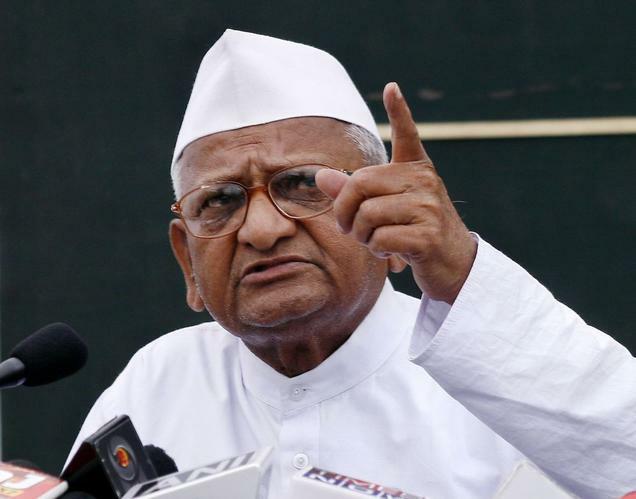 Guwahati, Nov 9 : Anti-corruption leader Anna Hazare Thursday appealed to the people of Assam to wake up to corruption and get ready for a second freedom struggle to secure their rights. The veteran activist was in Guwahati to address a national conclave organised on the problems of foreigners' infiltration, land rights for the indigenous people, floods and erosion, and the proposed mega dams in the northeastern region. Hazare said it took 90 years for the freedom fighters of the country to chase away the British from India, but the subsequent governments of the country are again inviting foreign companies to India and selling land, water, forests and other resources. "The government should have made policies to help the people of the country and their economic development. Instead of that, the government is making policies to help these foreign companies," he said. "I feel we have not received real freedom. So, we have to get ready for the second round of the freedom struggle," he said while addressing a large gathering at the Assam Engineering Institute (AEI) playground in the city Thursday. The activist also said that he would be touring the whole country from January next year as part of a massive awakening movement to make the people aware about corruption and other issues plaguing the country. He said his countrywide tour would continue for about one and half years, and hoped that during the tour he would again address a few meetings in Assam. He encouraged the people to press the government for establishing Gram Sabhas, which are sovereign institutions. He said these could be more powerful than the Lok Sabha and state assemblies. Assam's farmers' leader Akhil Gogoi and his organisation Krishak Mukti Sangram Samiti (KMSS) organised the conclave, in which many activists and other civil society groups from various states of the country also participated. Akhil Gogoi, who also spoke on the occasion, set a deadline of December 31 next year for the government to complete the process of updating the National Register of Citizens (NRC), which could help identify foreigners living in the state and deport them.